The Many Adventures of Winnie the Pooh came out March 11th 1977. It is a cartoon musical. It comes from the Walt Disney Productions Studio. The main characters in the movie are Winnie-The-Pooh, Piglet, Rabbit, Tigger, Gopher, Christopher Robin, Eeyore, Owl, Roo, and Kanga. It has ten different song in it. It has "The Wonderful Things About Tiggers", "Heffalumps and Woozles", and their are a other classic Disney songs in it as well. It is about a yellow bear named Pooh, and all his friends. 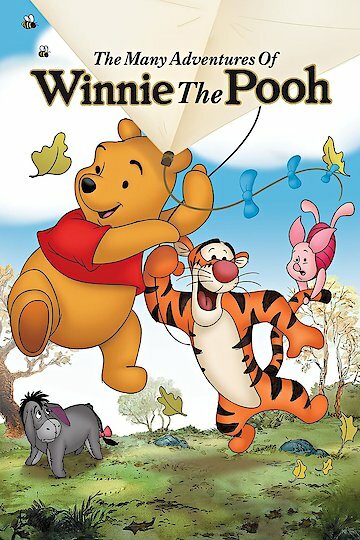 The movie takes place in the Hundred Acre Woods. In the movie Pooh, and his friends go on adventures. During the adventure Pooh, and his friends go on, they sing. The adventures they go involve honey, balloons, bouncing, bees, Pooh sticks, floods, and Eeyore's birthday. The Many Adventures Of Winnie the Pooh is a classic children, and family movie. The Many Adventures of Winnie the Pooh is currently available to watch and stream, buy on demand at Amazon, Vudu, Google Play, iTunes, YouTube VOD online.